Taxis in Wellington are easy to find and operate 24 hours a day. You can flag them down by the side of the road, or pre-book by phone or (occasionally) online. Average cost from the airport into the CBD, is around $25-$30. There are several different Wellington Taxi companies. All are privately run, there is no central public operator. Like most taxis, they're easily identifiable by the light on the top of the vehicle, and each firm will have branded colours and livery. They'll also have their basic rates displayed on the side doors of the cabs. These are worth checking before you get inside, as rates can often vary quite significantly. 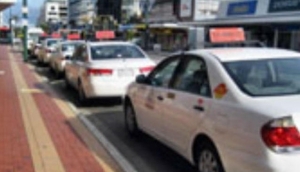 All cabs operate a flat rate, that applies as soon as you accept the ride, which then increments according to the length of your journey - usually per kilometre. Expect to pay surcharges for airport pick up and drop offs, credit card payment, and pre-booking. An example of longer fares, from the CBD to the Hutt Valley, the journey is around $60, to Porirua $50, and the Kapiti Coast around $100.